Super Bonus: king size 18" x 25" shoulder heating pad and 12" x 24" heating therapy pad could wrap your neck and shoulders, as well as back, abdomen and legs. Moist / Dry Heat Therapy Option: enjoy dry sauna like or moisten deep steam per your preferences. 3 Temperature Settings: digital controller adjusts heat easily with 3 temperature settings. 10ft Extra-Long Cord: makes it easier to use from the comfort of your bed or favorite chair. Buy without Worry: Amazon only takes a month after purchase to accept the return item. So please try to contact the seller or send a email to support@figam.net. 1. What temperature does this product reach? -Maximum temperature is about 140°F (60°C) when set to "Hi". This temperature is measured in the laboratory. The actual temperature varies with the air temperature and the individual difference. 2. How to set the automatic shutdown? 3. 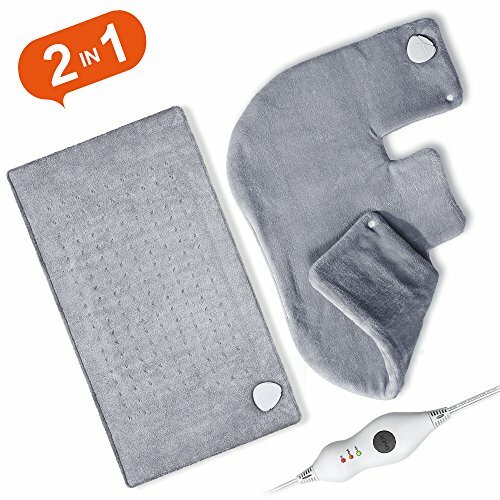 How to get moist heat from this heating pad? -a. Gently dab/pat one side of the Pad with a wet sponge/cloth or use a spray bottle to apply a fine mist. -b. Make sure the Control Connector or Pad Connector is not sprayed or dampened. -c. Place the moistened side of the Pad on top of the body. -d. Don't put the pad soaked. FULL BODY PAIN RELIEF: king size 18" x 25" is tailored to fit the neck and shoulder area; ultra soft 12" x 24" heating therapy pad is perfect for treating sore muscles in your back, shoulder, abdomen, legs and arms. MOIST/DRY OPTION: Moist heat therapy option provides faster and deeper penetration for more effective muscle relief; The dry heat although slower is just as effective at warming tissue and reducing pain. DURABLE MICROPLUSH: both sides are constructed from luxurious ultra plush that is exceptionally durable and warm, adding extraordinary comfort to your skin. 2 HOURS AUTO SHUT OFF: 2-hour auto shut-off feature with 10 ft extra-long power cord conveniently help you conserve energy and prevents burns caused by excessive heating. 90 DAYS RETURN WARRANTY: 90 days warranty plus ETL Certification and friendly customer service provide the highest customer satisfaction. If you have any questions about this product by FIGERM, contact us by completing and submitting the form below. If you are looking for a specif part number, please include it with your message.